This hickory live edge table was designed and handmade entirely by Earl Nesbitt. 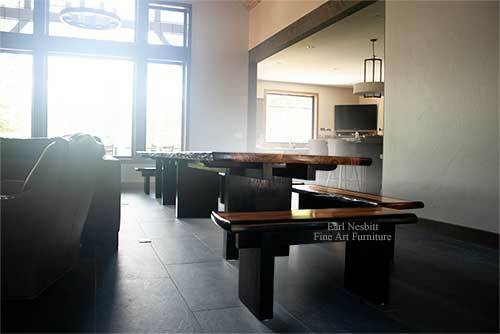 The custom made table is actually two tables which can be used together as one long 18' table or two smaller tables. The live edge is ebonized. 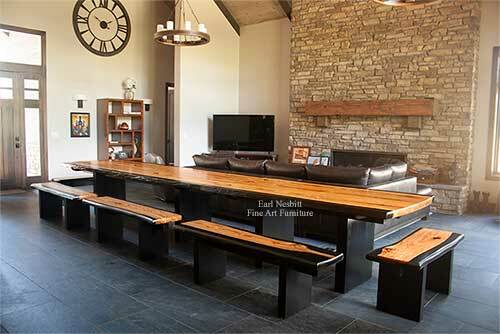 Five matching 5' and 3'6” long benches also have ebonized live edges. Hand rubbed tung oil based finish. Original design with hand carved signature by Earl Nesbitt. We ship Earl's furniture worldwide. 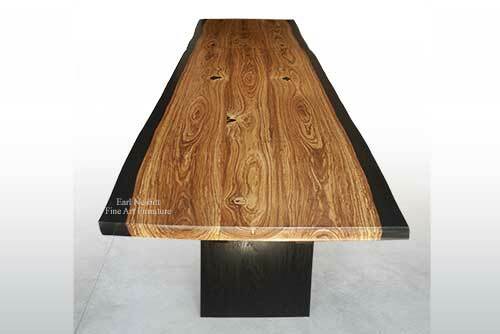 Earl began his career in 1989 studying fine art furniture design and construction in New Hope, Pennsylvania. That award winning apprenticeship program with a master craftsman as well as the rich history of furniture making in the New Hope area contributes to Earl's work as he showcases the beauty of natural wood in each piece. Durability is of the utmost importance: this hickory live edge table is built to last for generations. This along with limited production insures the collectibility of this piece which has Earl's hand carved signature and is archived to authenticate his original design and insure the customer's investment. Click here to see other designs by Earl that are ready to be shipped now. Earl sells his fine art furniture exclusively online through this website and at juried shows throughout the United States. He also enjoys the process of collaborating with a client on a custom made piece. 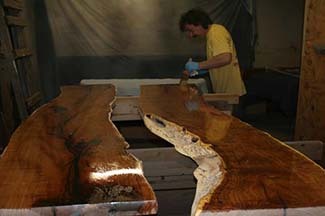 Call or email for a quote on your own hickory live edge table or other piece of fine art furniture.